Lots of people will say, "You don't look sick" or "You look well", to lupies. Most of the time, they're trying to be nice, and I accept it as a compliment of sorts. I know, however, that many lupies get sick of being expected to either "look sick" or "act well". There's some sort of belief that only people who look sick really are. I actually go to a lot of effort with make-up to try to not look sick. When the make-up's off, people who know me can tell when my lupus is flaring, or when I've done too much. 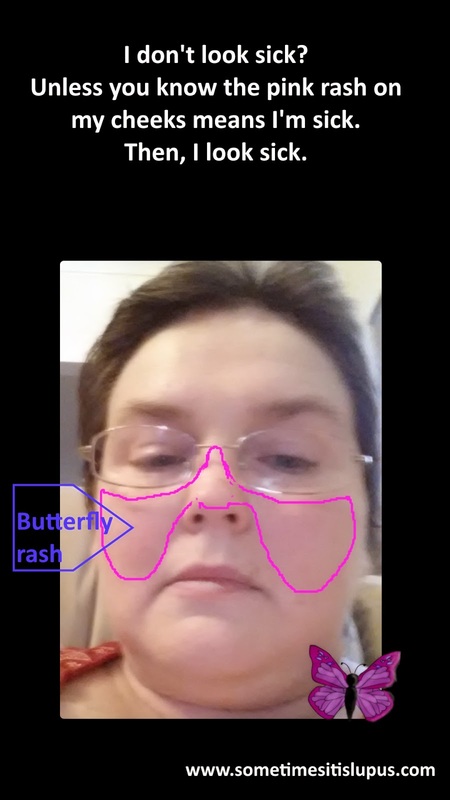 I get a light pink "butterfly" rash on my face. It's not really severe, and you'd have to know me to notice it. Some lupies have strong red rashes, and some even hurt. Of course there's also some lupies who never get a rash, or any other visible sign of what's going on in their bodies. Lupus is different for everyone who has it. You can't judge a book by its cover, or a lupie by her (or his) appearance. If someone you know has lupus, and they say they can't manage something, they probably can't. Even if they look perfectly healthy, they'll have limitations on how much energy they have and what they can achieve with it. Knowing my limits, and sticking to my limits, have always been challenging for me. On days when I'm feeling good, I want to just go ahead and do as much as I feel I can - even though, over the following days, that usually proves to be a bad idea. Worse than that, I am starting to feel like I'm getting really old, as I do less and less that I used to do. I don't think it's a matter of actual age. I didn't feel old when my kids became old enough to vote. I didn't feel old when I became a grandparent. I know that they're actually caring for me. But suddenly, I feel like I'm very, very old. 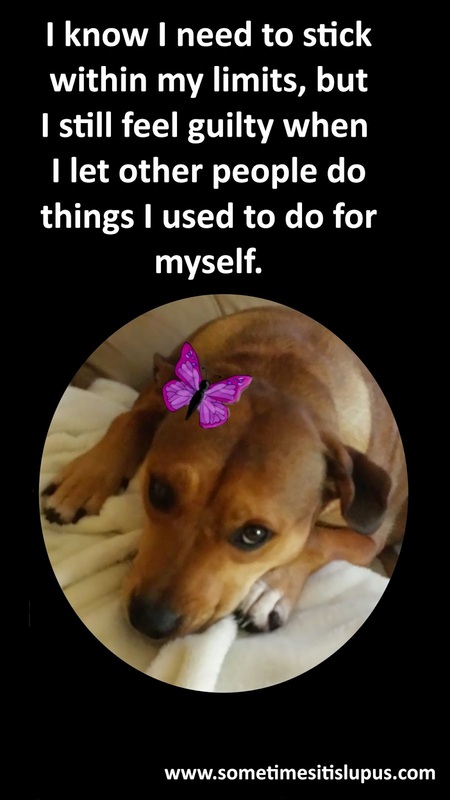 I also feel guilty when I sit by and watch other people do things I used to happily do. Every generation has to go through handing the baton on to the next - seeing our children take over the things we used to do. And I'm proud of them being willing and able to just take over. But I also feel old, useless, and rather guilty, that when they're taking on these tasks, I haven't picked up something else to do. Instead, I'm just lying on the couch and letting everyone else do the work. That's where I suspect the experience would have been different, had I still been healthy. I would have found other, still useful, things to do. Instead, I'm on a prolonged holiday while everyone else is working.